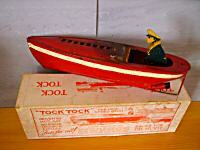 The picture to the left is that of a "Tock Tock" boat. Although the box and instructions are all in English, the boat is clearly stamped with the words "Made in Germany", this is particularly interesting, as it was only ten years after the cessation of The Great War. The boats were run on a solidified version of meths known as Meta, although the instructions say candle stumps can be used. The figure on the burner tray is printed, not painted and appears to be that of a quite severe looking naval officer. To the left is a photograph of a French version of the 1920's single pipe boat. 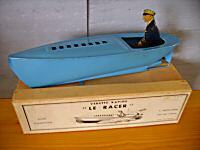 The box grandly describes it as a "Vedette Rapide" (fast patrol boat) and entitled "Le Racer" (yes you've guessed it The Racer!). Further statements in French complete the box lid, telling us it is a scientific toy and its propulsion is by hot air! Curiously it also says "Made in France" in English. Could this be a half hearted attempt to trade with their allies? The inside of the lid contains instructions, all in French. Left is another boat from the same era. 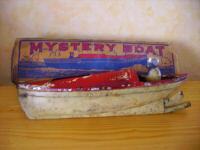 Marketed by Gobar Products of Anderson, Indiana, USA, it was informatively called the "Mystery Boat". The box lists 3 patents, the last one being August 24th 1926, so we can say with confidence it comes from the second half of the 1920's. This one was fuelled by "about a thimbleful of Sterno" (solidified alcohol). The figure on the burner tray is civilian, not naval. I also own a almost identical boat, that was marketed as a "Mystery Tug Boat", and was made by "The Universal Tool & Die Company" of Indianapolis, Indiana and sold by "The Buckeye Toy Company" of Cleveland, Ohio. Boats being produced today normally have 2 pipes. They are much easier to prime prior to firing up. Why not purchase one from me on eBay, you'll be amazed!